As the general rule goes, you should never bring a knife to a gun fight… unless of course that knife happens to be an NRS-2, a knife that also just so happens to have a gun built into the handle. Designed in early 1980s for Spetsnaz troops, the NRS-2 is still used today by some members of the Russian special forces. The origins of this peculiar firearm can be traced back to the 1970s when engineers working at the Tula arms factory were tasked with creating “a close combat weapon for army reconnaissance units“. Under the oversight of designer, R. D. Khlynin, an early precursor to the NRS-2 known, interestingly enough, as the NRS, was developed that made use of the recently created SP-3 ammunition. These are specialised “silenced” bullets that had been developed during the Cold War period especially for spies and special forces units operating either covertly or behind enemy lines. Although noticeably weaker than conventional bullets, SP-3 ammunition was considered to be acceptably powerful for single shot weapons like the MSP special compact pistol which was also developed under the supervision of Khlynin. But the NRS wasn’t just a knife with a gun in the handle, it also doubled as a screwdriver, a saw and even had a tool built into the scabbard that could cut through wires up to 5mm thick. The scabbard was also insulated so that the knife could be used to cut through live electric cables, so long as the line wasn’t transmitting more than 380 volts. A few years later when SP-3 ammunition was phased out in favour of the more powerful and reliable SP-4 ammunition, the NRS was redesigned by G. A. Savishcnev, I. P Shedlos, and V. Ya. Ovchinnikov to make use of it. Along with providing greater killing range, the NRS-2 included a number of other notable improvements such as an attachment for crimping primer caps and a sharper tip more suited for stabbing through thick cloth and thinly armoured targets. This new and improved gun knife officially went into service in 1986. So how exactly does the NRS-2 work you ask? Well, to put it simply, housed just inside of the knife’s handle is a small gap, in which an incredibly rudimentary firing mechanism can be found. This mechanism can store one round at a time and needs to be removed once the round has been spent. 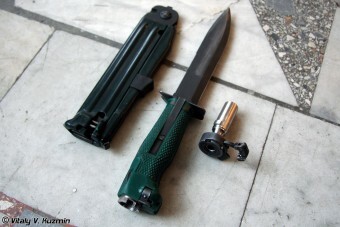 The handle of the knife also features a safety switch to prevent accidental discharge and a set of iron sights to help with aiming. Speaking of which, since the gun part of the NRS-2 is house inside of the handle, to aim and fire the NRS-2 you need to point the knife end towards your own face. While this is looks unthinkably stupid, firing the NRS-2 in this fashion isn’t considered overly dangerous because it has “almost nonexistent recoil“. On top of this, the NRS-2 has virtually no muzzle flash and the shot itself is relatively silent, making it an incredibly covert and deadly weapon in the right hands. In terms of range, while exact details are hard to come by since the NRS-2 is generally only used by Russian Special Forces and this information isn’t widely available, it is said to be deadly from up to 25 metres away. In the event the user misses with his one shot, the NRS-2 is also specially weighted so that it can be used as a throwing knife. While the NRS-2 has the potential to be an incredibly deadly weapon in the right hands, it’s noted that it’s mostly treated as a curio by most of today’s Spetsnaz troops who prefer to use the version without a gun hidden in the handle. This version, known simply as the NR-2, instead of a gun has a number of survival implements like matches, a compass and other goodies an enterprising soldier may need. Nevertheless, the NRS-2 continues to stand as a testament to man’s ingenuity when it comes to coming up with new ways for killing one another. A common misconception about the NRS-2 is that the weapon actually shoots out the blade of the knife instead of a bullet. While ballistic knives are indeed a thing that exist, they are generally inferior to the NRS-2 due to the fact they’re only accurate and, perhaps more importantly, deadly, at a fraction of the range. While it is rumoured that ballistic knives were at one point developed for the Spetsnaz, there’s little proof they ever used them outside of Tom Clancy novels and Call of Duty games. Not that they’d need them anyway considering an integral part of Spetsnaz training is learning to use throwing knives. 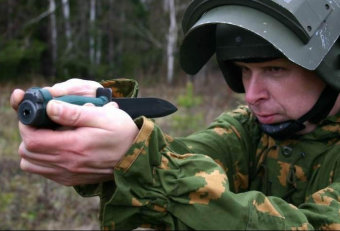 The training is so in depth that even the standard issue shovel issued to all Russian soldiers for digging trenches can be used as an impromptu throwing device in the hands of a trained Spetsnaz soldier. 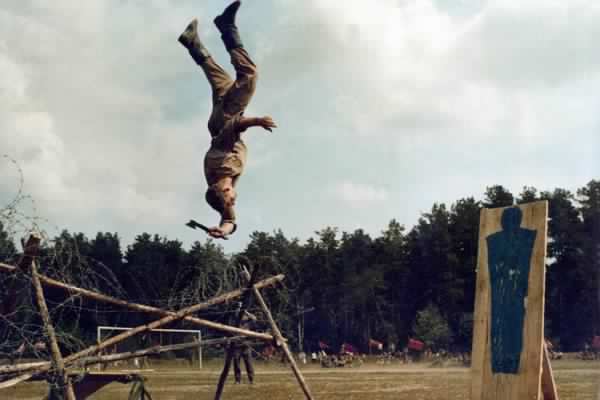 Spetsnaz troops are so well trained at throwing objects with deadly, unerring accuracy that when putting on a show, you can see them hurling shovels, knives and even hatchets at targets while performing such acrobatics as backflipping through the air, as depicted above. Special purpose small arms ammunition of USSR and Russia. Laughed so hard at the 2nd picture. Anyway, I am loving your site. Keep it up. Any posts on “antique trap guns?” Those are… interesting (and not for trapshooting).